Headlined by JUNO Award-winning jazz vocalist Sophie Milman and hosted by Canada AM’s Beverly Thompson, this is the third annual Moonlight Gala in support of the McMichael Gallery. 500 guests enjoyed a night of exquisite food and charming live entertainment, while surrounded by the boundless beauty of nature. Greeted by valets early that evening, guests arrived at the McMichael Gallery, which stretches across a serene 100 acres of wooded landscape. Tents were raised just outside the gallery for everyone to experience a garden party, while the gallery interior served as a bustling post for food stations and silent auctions. The support for this historic gallery, along with the importance of Canadian art are what attracted the likes of Jeanne Beker, Steve Paikin and many other guests to this Gala. Jazz musicians Sean Jones and Alana Bridgewater performed with the band, The Collective, throughout the night. The duo took turns weaving through the crowd, intimately serenating to a delighted audience. The most anticipated act of that evening went to the lovely Sophie Milman, and her performance of songs from her current album, aptly titled, In the Moonlight. Sophie’s smooth and sultry voice captivated and ushered spectators to the stage. 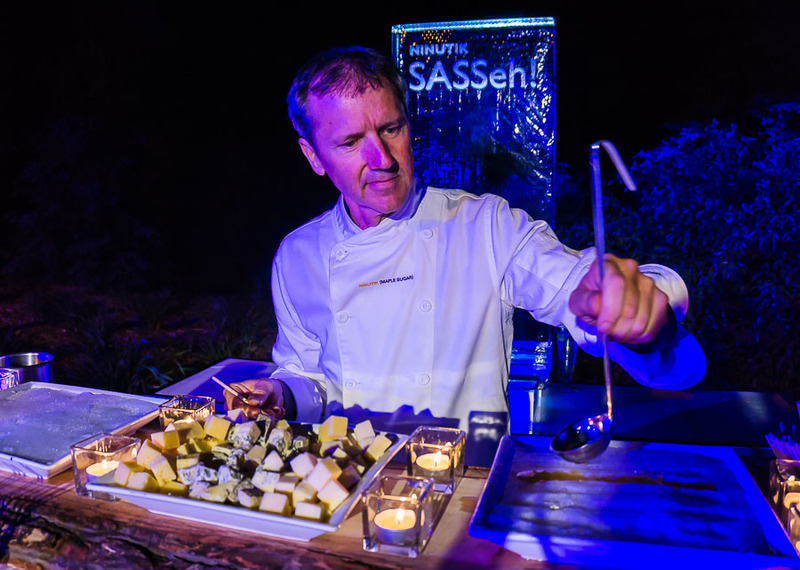 As night fell, hungry guests were able to enjoy an array of gourmet dishes. From Daniel et Daniel’s buttery sous vide strip loin to Dolcini’s delectable dessert gems, the food was both sophisticated and fun. My personal favourite was the maple taffy with cheese from Ninutik SASSeh. This twist on an old Canadian classic, made by pouring maple syrup on snow, was raised to another level by wrapping a cube of savoury cheese inside the sweet gooey taffy. The line was long but worth the wait, even to watch the server prepare this delicacy. Opened to visitors at the gala, we had the great fortune of strolling through the ground level of the gallery. The McMichael Canadian Art Collection is the only major gallery in Canada with a mandate to collect Canadian art exclusively with a permanent collection of 6,000 artworks by Tom Thomson, the Group of Seven, their contemporaries, and First Nations, Métis, Inuit and other artists. At the gallery entrance, we were astounded by the ingenuity and creativity of Cube Works Studio, as they prepared an installation of Tom Thomson’s famous Byng Inlet using a large collection of Rubik’s cubes. The exterior of the McMichael matched the beauty of its interior space. An architectural marvel, the gallery is designed in a modernist idiom and built with fieldstone and hand-hewn logs. Visitors are able to enjoy the views of the densely wooded Humber River Valley through the floor-to-ceiling windows in each of the 13 galleries. Engulfed by nature and greenery, the gallery space serves as a continuous reminder of the most coveted art subject of the Group of Seven. Perhaps the most memorable part of the night belonged to the final segment of performances between Sean Jones and Alana Bridgewater with The Collective. They quickly managed to get everyone (even the shy ones!) on the dance floor while belting out R&B and rock hits of the 70’s and 80’s. The crowd was ecstatic and danced away to the fury of the music in the moonlit night. Moonlight Gala 2014 raised over $150,000, far surpassing last year’s mark. 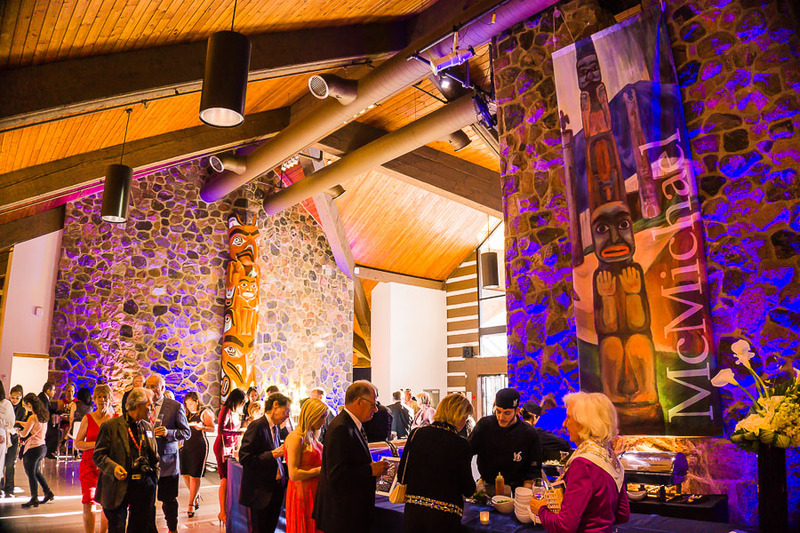 The chair of this fundraiser, Diane Wilson commented, “The McMichael has had an incredible few years…Moonlight Gala 2014 ties into the dramatic success of the gallery, and its ability to deliver world-class exhibitions and provide strong educational programming”. All the guests couldn’t agree more with their tremendous turnout in support of this iconic Canadian treasure.